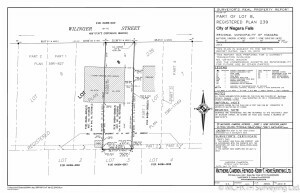 A Real Property Report (RPR) is a legal document that clearly illustrates the location of significant visible improvements relative to property boundaries. (Improvements to be shown are outlined in Part D, Section 7.6 of the Manual of Standard Practice, which can be found at www.alsa.ab.ca). It takes the form of a plan or illustration of the various physical features of the property, including a written statement detailing the surveyor’s opinions or concerns. It can relied upon by the Buyer, the Seller, the Lender and the Municipality as an accurate representation of the improvements on your property. Property compliance with municipal requirements. Any problems relating to the property boundaries. In the planning and development process. Protection from potential future legal liabilities resulting from problems related to the property boundaries and improvements. Problems that may have to be resolved prior to registration of the mortgage. Have information to avoid delays in completing property transactions when a Real Property Report is arranged early in the sales process. Purchasing a property may be the largest financial investment you ever make. With a Real Property Report, owners are aware of any boundary problems. They know whether their new home is too close to the property line, or part of their garage is on the neighbor’s land, or vice versa. Since legal complications may occur if a sold property fails to meet requirements, a Real Property Report protects the Seller. How does municipal compliance protect you? A Real Property Report is necessary to determine compliance with municipal bylaws. A municipality reviews and endorses the Real Property Report and indicates if the improvements meet the requirements of the local bylaws. The property owner can then resolve any outstanding issues identified by the municipality. Early preparation of a Real Property Report significantly speeds up the process of selling a property. 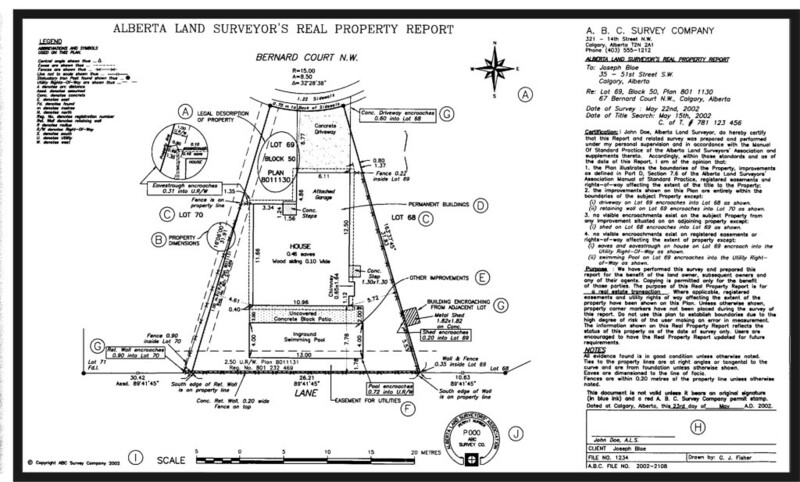 The Real Property Report is a “snapshot” of the property on the date of the survey. Changes are often made to improvements on the property or adjoining properties. These may be new or modified fences, decks, driveways, garages or other features. Only an updated Real Property Report can show their location relative to property boundaries. Changes to your title will also be shown. In many cases, it is more economical to update an existing Real Property Report. As a service to the public, the ALSA has initiated a RPR index for Alberta. Go to www.rprindex.ab.ca to enter any address to see which survey firms have performed an RPR on the property. Please note that this service is voluntary and not all land surveyors register their records with the RPR index. A municipality may request additional information. The amount of work to prepare a Real Property Report varies between properties. Lot size and shape, number of buildings, natural features, age and availability of the property boundary information all affect the cost. A Real Property Report is only a small portion of your total property investment and may help you avoid costly problems in the future. A Real Property Report does not include replacement of any property corner posts. Arrangements can be made to have property boundaries visibly marked on the ground. It is most economical to have this additional service performed at the time of the survey. Neighboring landowners occasionally share the cost because of the mutual benefit of the Real Property Report and marking of boundaries. At Typical Residential report costs around $500.00 and up. Alberta Land Surveyors’ Association – who are Alberta Land Surveyors? Alberta Land Surveyors are professionals – current standards require a university degree followed by an articling period and a series of professional examinations. Land Surveyors are governed by provincial law with a mandate to protect the public’s interest in matter of real property boundaries. Additionally, they must be registered with the Alberta Land Surveyors’ Association. An extensive practice review program ensures surveyors maintain high professional standards. An Alberta Land Surveyor if fully responsible for the accuracy of the information in a Real Property Report. Land Surveyors carry professional liability insurance as added protection for the consumer. 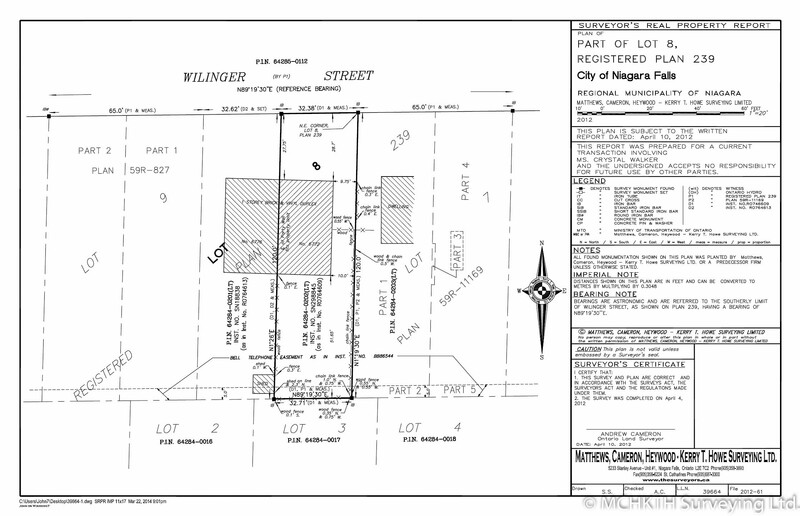 Development and building permits require boundary information. 10.1 The seller or seller’s lawyer will deliver normal closing documents to the buyer’s lawyer upon reasonable trust conditions consistent with the terms of this contract, including delivery within a reasonable time before the Completion Day to allow for confirmation of registration of documents at the Land Titles Office, obtain the advance of mortgage financing and verify the transfer of other value items. 10.2 Closing documents will include and RPR showing the current improvements on the Property according to the Alberta Land Surveyors’ Association Manual of Standard Practice, with evidence of municipal compliance or non-conformance and confirming the seller’s warranties about the land and buildings. This obligation will not apply if there are no structures on the land. The buyer or buyer’s lawyer must have a reasonable time to review the RPR prior to submitting the transfer documents to the Land Titles Office. (a) provide us with a real property report showing the current state of improvements on the property according to the Alberta Land Surveyors’ Manual of Standard Practice, with evidence of municipal compliance or non-conformance, within ten days of signing this agreement, unless the property is a conventional condominium. Not having this real property report may result in problems on closing or rescission of the purchase contract. The Seller must provide to the Buyer a current Real Property Report. This should be ordered before listing the property for sale or as soon as possible after listing the Property For Sale. If there are issues with the placement of improvements (Buildings, Fences, Decks Balconies, Side Walks, Retaining Walls), it is better for the seller to understand the problems and deal with them before closing date. If you have an existing RPR report and it is not current – meaning too old, or there have been additional improvements to the property since the RPR was completed, you may be able to get your existing Real Property Report updated. Call the original Survey Company (name should be on the Original Document) that completed the report and ask if they can update it (tell them what has changed); at the same time get a price quote. They will need the street address and possibly a Job Number off of the original. Typically, if the report is older than 5 years old, it should be updated. If your original document is called a Land Survey or anything other than a Real Property Report, you will need a new one. The purchase contract also states “with evidence of municipal compliance”. What this means, is that the City must also Review, Accept and Stamp the Real Property Report. A Certificate of Compliance is a confirmation from The City of Calgary that the locations of structures on a property comply with the Land Use Bylaw . This is confirmed on a Real Property Report prepared by an Alberta land surveyor. It does not regulate or enforce any building code requirements or serve as a confirmation of permit history on a property. A Certificate of Compliance is usually required by lending agencies or lawyers in the sale of a property and/or mortgage approval to protect their clients’ investments. Standard real estate purchase contracts often require the vendor to obtain a compliance certificate. A Certificate of Compliance is not a legislative requirement, but rather a service provided by The City of Calgary. Digital Submissions for a certificate of compliance can only be processed if the digital file submitted was created, digitally signed, and secured by a Licensed Alberta Surveyor. Scanned copies of RPRs are not acceptable. In most cases the survey company should be able to identify any problems on the RPR in advance of taking it to the city. If there are problems, you may want to fix them first before requesting Municipal Compliance. Let say, you need to remove a retaining wall to correct a problem. After the repair, the survey company would need to go back and resurvey, then reprint the report before applying for City Compliance. Please speak to our team and/or your Lawyer for clarification if the initial survey shows problems. If you choose to have the survey company complete the Municipal Compliance portion for you, you should instruct them not to apply for compliance if there are problems shown on the RPR, before disusing it with your lawyer. Don’t wait at the counter: Book your E appointment online in advance – this process allows you to show up at your scheduled appointment time and not wait in line for hours (literally).